(Polyphemus) 'Hear me, great Neptune; if I am indeed your own true-begotten son, grant that Ulysses may never reach his home alive; or if he must get back to his friends at last, let him do so late and in sore plight after losing all his men.' Thus did he pray, and Neptune heard his prayer. The Odyssey - Book IX - Translation by Samuel Butler. Poseidon (Neptune) is the "bad guy" of Homer's Odyssey and in general of the Greek myth. A brother of Zeus and Hades he won the sea when the three drew lots in a helmet (Zeus had the sky and Hades the underworld). When angered he struck the earth and the sea with his trident causing earthquakes and storms. Although the god of the sea, Poseidon craved earthly kingdoms and he competed with Athena to become the patron of Athens. He thrust his trident on the Acropolis where a well of sea-water immediately gushed out; Athena planted the first olive-tree beside the well. Poseidon, in a fury, challenged her to single combat, and Athena would have accepted had not Zeus interposed and ordered them to submit the dispute to arbitration. (..) Zeus himself expressed no opinion, but while all the other gods supported Poseidon, all the goddesses supported Athena. Thus by a majority of one, the court ruled that Athena had the better right to the land, because she had given it the better gift. From Robert Graves - The Greek Myths. This account indicates how the importance and worship of Poseidon declined in favour of new, younger gods such as Athena and Apollo. 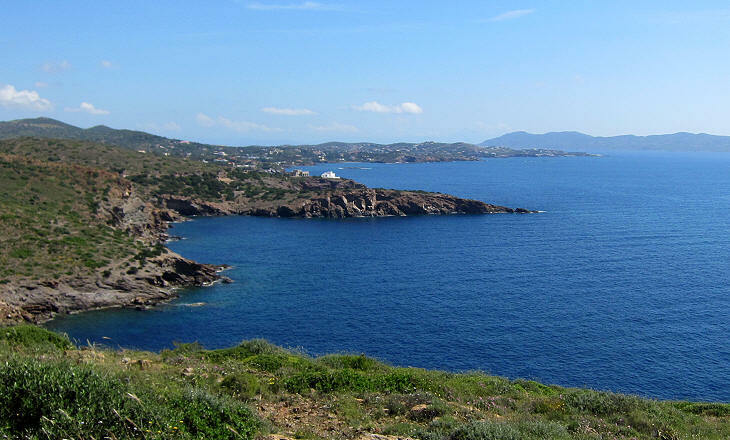 In the VIth century BC the Athenians, in order to retain the protection of ill-tempered Poseidon, dedicated a sanctuary to him at the end of Attica, the peninsula where Athens is located. The area was of great importance to them, because of its silver mines which granted the city its wealth. 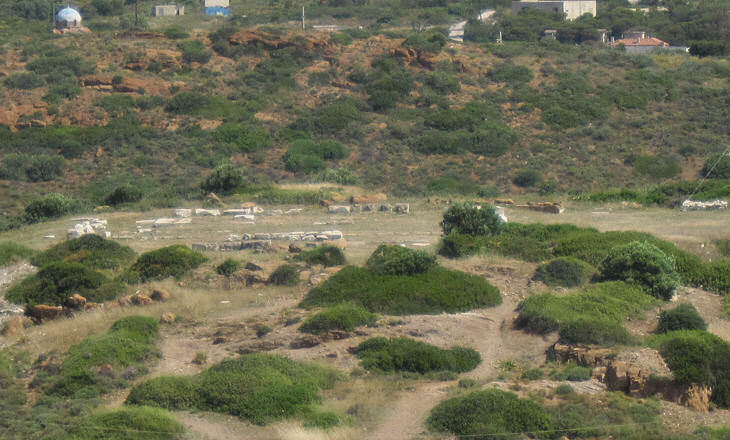 The site chosen for the sanctuary was a cape which was the first to be seen by ships sailing from the Aegean Sea towards Piraeus, the port of Athens. Sailors were particularly devoted to the sanctuary which was a very useful landmark and indicated to them that they were about to reach their destination safely. 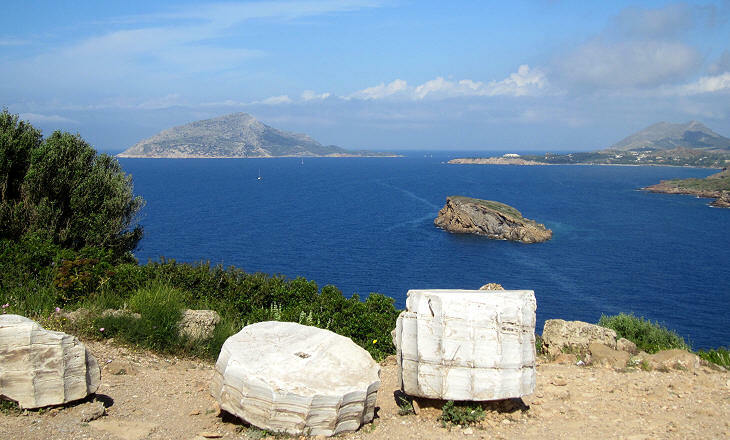 Aegeus, king of Athens, came to this cape to wait for the return of his son Theseus from Crete. The Athenians were required to send seven youths and seven maidens every ninth year to the Cretan Labyrinth, where the Minotaur waited to devour them. Theseus offered himself as one of the victims in the hope of killing the Minotaur with his bare hands and having the cruel burden remitted. 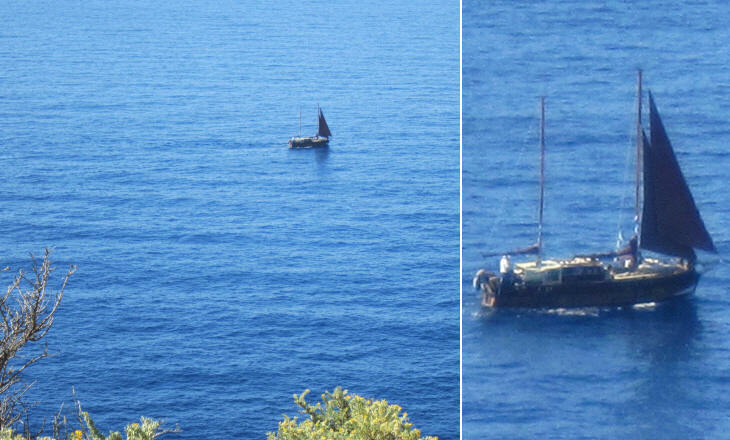 On previous occasions the ship which conveyed the victims had carried black sails, but Theseus was confident that the gods were on his side, and Aegeus therefore gave him a white sail to hoist on his return, in signal of success. Theseus did manage to kill the Minotaur and returned to Athens after stopping at Delos to sacrifice to Apollo; he forgot however to hoist the white sail; Aegeus sighted the black sail and cast himself into the sea, which was thenceforth named the Aegean Sea. From Robert Graves - The Greek Myths. 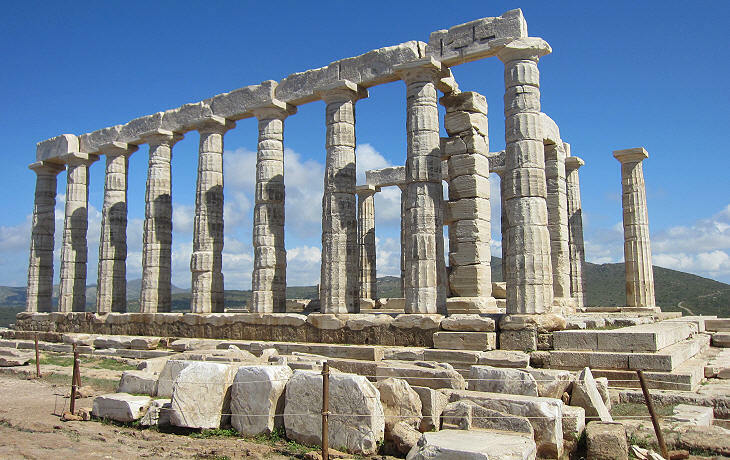 The temple to Poseidon was rebuilt in 444-440 BC after it had been destroyed by the Persians. 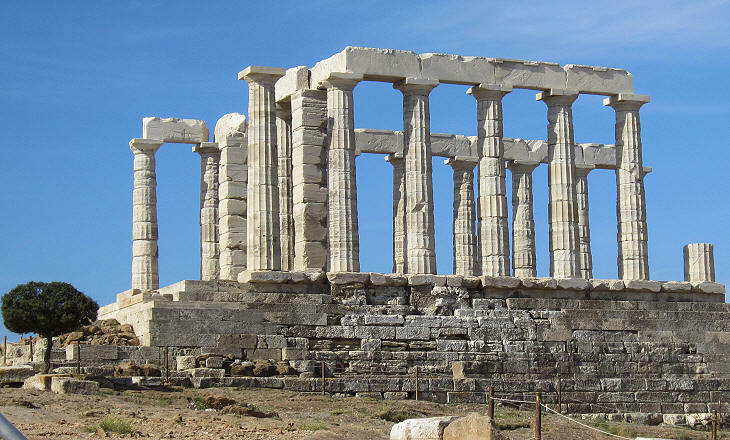 It is therefore a monument of the Golden Age of Athens, the period of the Vth century marked by the leadership of Pericles. The north-eastern side of the complex of buildings composing the sanctuary was protected by walls and towers in case of attack by the Spartans; the other sides were protected by high cliffs. The temple stood on a high podium which increased its visibility. It was built in Doric style, but its fluted columns have sixteen grooves, rather than the usual twenty, perhaps to reduce the impact of erosion; it had 34 columns, of which 16 are still standing. It is oriented on an east-west direction with the front on the east. Usually visitors come to the archaeological site in the late evening to take pictures at sunset, but the temple is best seen in the early morning. 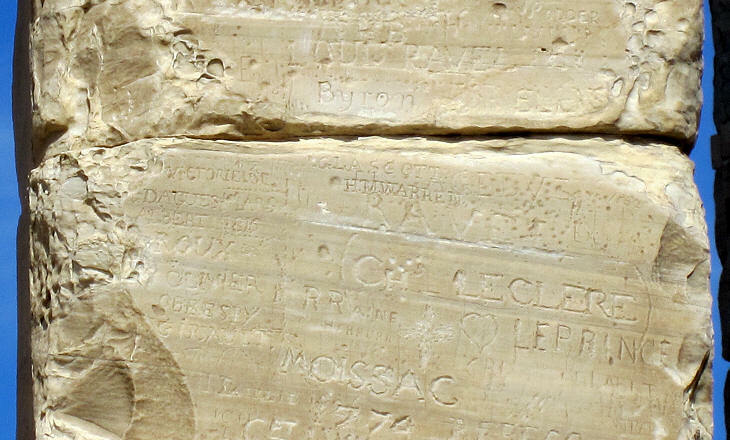 Lord Byron made reference to the site by its Greek name, but sailors (and cartographers as well) called it Cape Colonna, the cape of the columns, well into the second half of the XIXth century. The name was given by the Venetians (they gave the same name to a cape on the island of Egina). 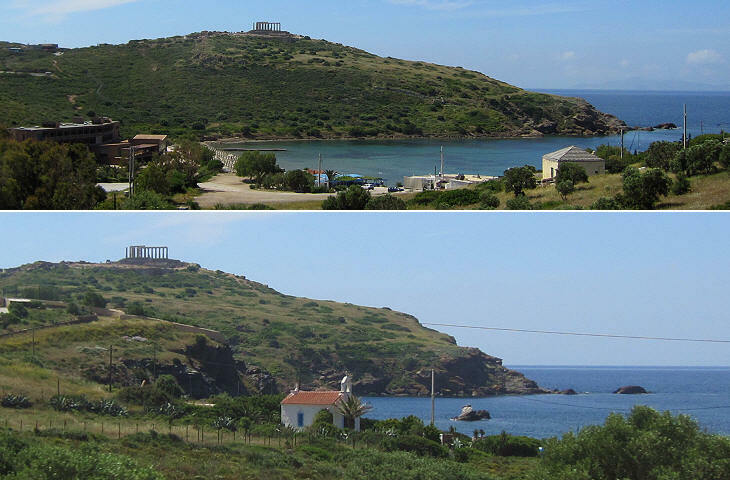 The Athenians built a temple to Athena on a hill near the cape; it was a less imposing building than the temple to Poseidon and its location was somewhat hidden from the view from the sea as if the Athenians pursued a policy of pleasing both gods. The dispute between Athena and Poseidon about Athens was just one of their many quarrels; all along the Odyssey Athena helps Ulysses, while Poseidon does his best to hinder his return home; another cause of conflict between the two related to Medusa, a beautiful young girl whom Poseidon raped inside a temple dedicated to Athena; in revenge the goddess turned Medusa into a horrible monster (young women in olden times, as still often occurs in modern society, took the blame for having been raped). 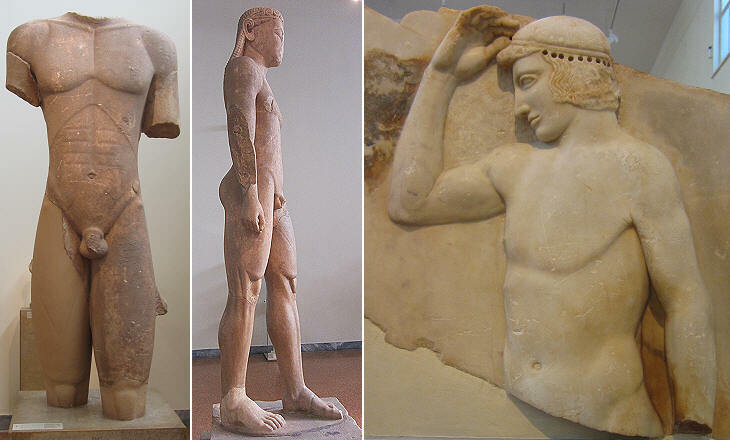 Archaeologists found a kouros, a standing statue of a naked young man right in front of the temple to Poseidon; these statues are typical of early Greek civilization and were usually associated with the worship of Apollo, because the gigantic statue of this god at Delos portrayed him as a kouros. 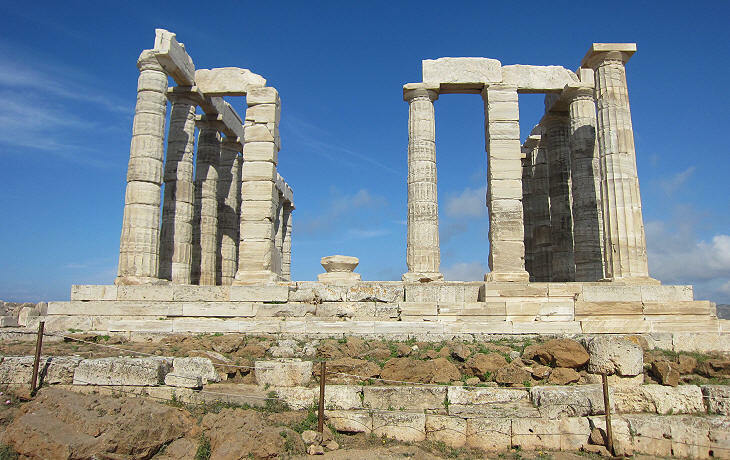 The sanctuary of Sounion was the site of periodical festivals, probably at the beginning of winter, which involved games. The Romans regarded Neptune, Poseidon's Latin counterpart, mainly as a horse god. During the Roman Empire sailors sought the protection of Isis, rather than that of Poseidon (you may wish to see the Temple to Isis at Sabratha). Oceanus, rather than Poseidon, was portrayed with sea creatures in many mosaics of the Late Empire, such as that found near Antioch.